Almo Nature Daily Menu Pouches comes in a range of highly-digestible and completely delicious meat and fish varieties. This juicy complete food contains high-quality ingredients which have been prepared in their own stock in order to retain their natural flavour and valuable nutrients. This ensures that your cat receives all of the vital nutrients such as proteins, vitamins and minerals needed to remain happy and healthy. The Almo Nature Daily Menu recipe is also free from chemical additives such as colours and preservatives. Thanks to the high moisture content of this food, your cat is encouraged to take on sufficient fluids to remain healthy. 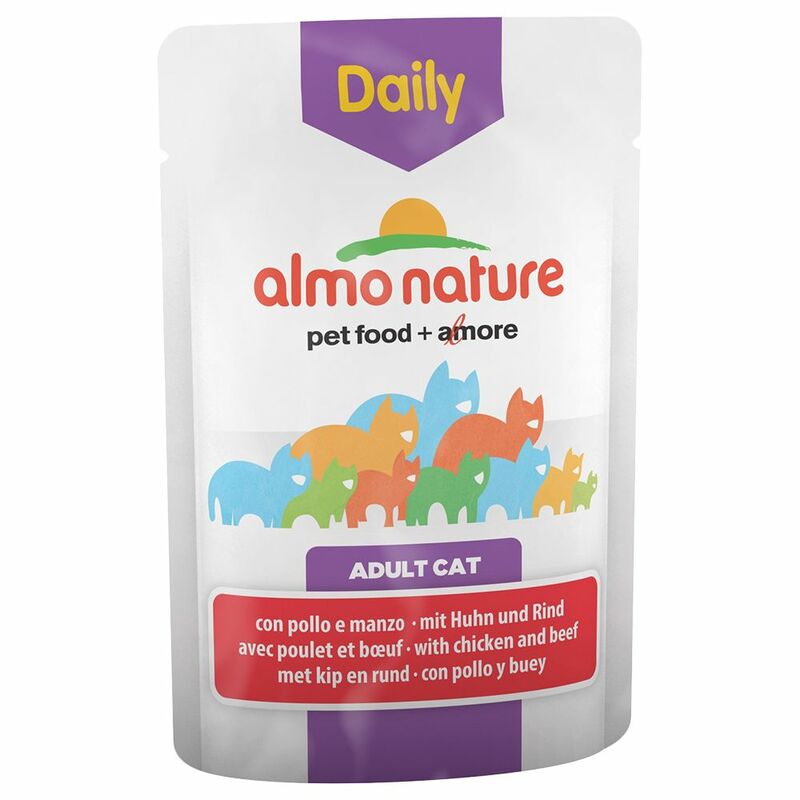 The practical Almo Nature Daily Menu Pouches make it easy and hygienic to portion out the food for your cat, as well as preserving maximum freshneΒ and flavour. This complete balanced food is the ideal way to give your cat its daily requirement of nutrients in a delicious recipe. Almo Nature Daily Menu Pouches 70g at a glance: Complete balanced cat food With high-quality, nutritious ingredients in premium pet food quality Cooked in its own stock: to retain natural nutrients, for optimum flavour and digestibility With meat or fish: in a range of flavour varieties Natural: sugar-free and free from artificial additives such as colours or preservatives Practical pouches: clean and easy portioning and maximum flavour protection Rich in moisture: to support a sufficient intake of fluids For daily nutrition: to keep your cat's overall wellbeing high Please note: Almo Nature cat food is entirely natural. The varying nutrient contents of this variety will ensure a balanced diet for your cat. Almo Nature Daily Menu is a complete cat food.